Kannur or Cannanore is well connected to the rest of India by Rail and Road. 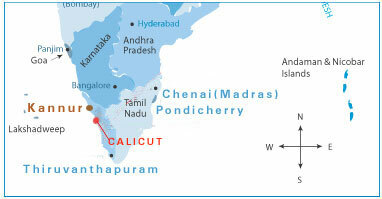 The best way to reach is by air to Kozhikode (Calicut- 90Kms.) and then by rail or road to Kannur, traveling about 14km east through state highway will reach you to our office. Arrangement can be made to pick you up from the airport. Around 10 trains throughout the day travel to Kannur from Mangalore and Kozhikode. There are two daily flights from Mumbai to Mangalore and Kozhikode, a day flight from Channai to Kozhikode and a daily flight from Bangalore to Mangalore. Please check with Travel agents regarding more information. Please spent some time in leting us know a few details about yourself and your valuable suggestions to develop us to higher standerds.